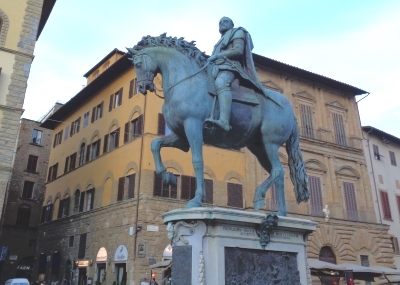 The square Piazza della Signoria is the most important square in the center of Florence. There are many interesting things to see. In this article you will learn which important sights you should visit in and around Piazza della Signoria. The Piazza della Signoria (very freely translated city hall square of Florence) is considered the center of the city, it is about 300 meters south of the most famous building of Florence, the huge cathedral. The most important building is the Palazzo Vecchio (Old Palace). It was from here that the powerful Republic of Florence was ruled. After the cathedral it is the most important building of the city. Until today the building has remained the town hall of the city. 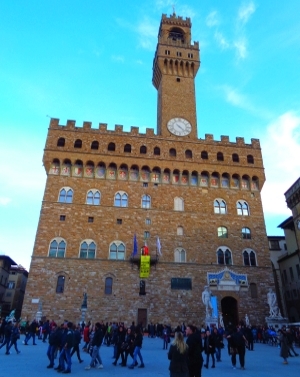 Palazzo Vecchio is a huge building with a high tower. In the palace today are some great sights like museums. We have created our own article about the Old Palace, which you can find on this link. The queues at the ticket counter in Palazzo Vecchio are often very long. You often waits more than 2 hours. However, you can buy tickets on the internet on this website. These tickets without queuing are a bit more expensive. For more and more big sights in Italy there are such online tickets with preferential admission. You save hours of queuing, but you pay a little more. On the link above you can also buy tickets for the two big art museums Uffizi Florence and Accademia Florence, where the waiting times in the queue are sometimes even longer. 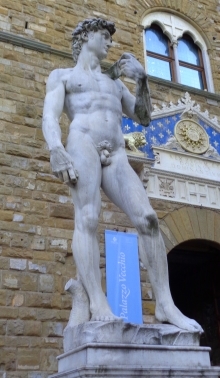 Probably the most photographed sight in Piazza della Signoria Florence is the famous statue of David by Michelangelo, one of the most famous works of art in the world. 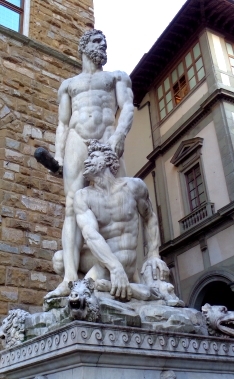 It is directly in front of the entrance of the Palazzo Vecchio. However, it is only a (very good) copy. The original is a few hundred meters away in the Museum dell Accademia for security reasons. Next to the Statua del David stands another famous sculpture: „Judith and Holofernes“ by Donatello. Much bigger and no less interesting is the sculpture „Ercole e Caco“ (Hercules and Cacus) by Baccio Bandinelli. While „Judith and Holofernes“ is made of bronze, the David by Michelangelo and „Hercules and Cacus“ are made of the beautiful light marble of Tuscany. To the right of Piazza della Signoria there is an open building that strongly reminds of the Feldherrnhalle in Munich. The building, also called Loggia della Signoria, with three round arches (arcades) also houses large statues. Among others there are „The Robbery of the Sabine Sisters“ by Giambologna and „Perseus with the Head of Medusa“ by Benvenuto Cellini. In Piazza della Signoria (built 1376 and 1382, Loggia dei Lanzi, Gothic style) you can enter the loggia free of charge. Here again, not everything is original. Many sculptures are very good copies, the actual sculptures are in museums. 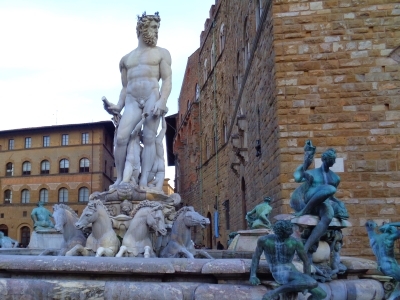 Many visitors are also attracted by the beautiful fountain Fontana del Nettuno (Neptune Fountain) in the 16th century Piazza della Signoria. The architect of the Neptune Fountain in Florence was Bartolomeo Ammannati (built in 1565). The occasion was the wedding of Medici Francesco with Joan of Arc of Austria. Name of the square: The word „Signoria“ in the name of the square is the former name of the government in the Republic of Florence. So you could translate „Piazza della Signoria“ with government square, a very free translation would also be town hall square. Until today, the largest building on the square is the Florence Town Hall. Execution site: For many centuries people were executed on Signoria Square in Florence. The famous execution of Girolamo Savonarola (the de facto head of the Republic of Florence) also took place in Piazza della Signoria. A plate in front of the Neptune Fountain commemorates the execution of the death sentence against Savonarola in 1498. Access: The area around Piazza della Signoria is largely a pedestrian zone. Parking in the center of Florence near the major sights is extremely expensive. Close by: In addition to the Uffizi Art Museum, the river Arno with perhaps the most famous bridge in the world (Ponte Vecchio) is barely more than 100 metres away from Piazza della Signoria. Also to the cathedral of Florence it is only about 300 metres, you can explore Florence on foot without any problem. Behind the Uffizi at the Arno, you also find the museum Galileo.